Prep football • Las Vegas' Bishop Gorman tops USA Today rankings. Steve Griffin | The Salt Lake Tribune Bingham quarterback Kyle Gearig gets into the Brighton secondary during first half action in the 5A championship football game at Rice Eccles Stadium in Salt Lake City, Utah Friday, November 22, 2013. Steve Griffin | The Salt Lake Tribune Bingham running back Scott Nichols gets into the end zone ahead of Brighton's Semi Fehoko during first half action in the 5A championship football at Rice Eccles Stadium in Salt Lake City, Utah Friday, November 22, 2013. 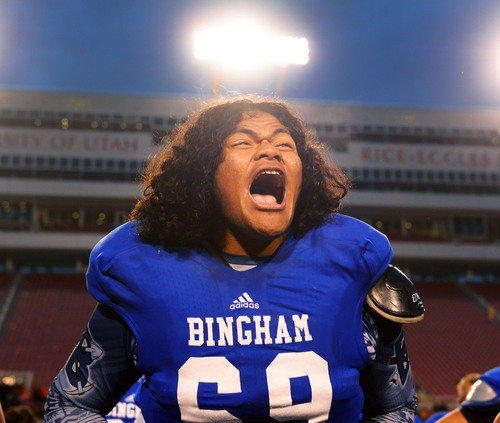 Steve Griffin | The Salt Lake Tribune Bingham's Noa Taeatafa screams with excitement as Bingham performs the Haka after they defeated Brighton for the 5A championship at Rice Eccles Stadium in Salt Lake City, Utah Friday, November 22, 2013. 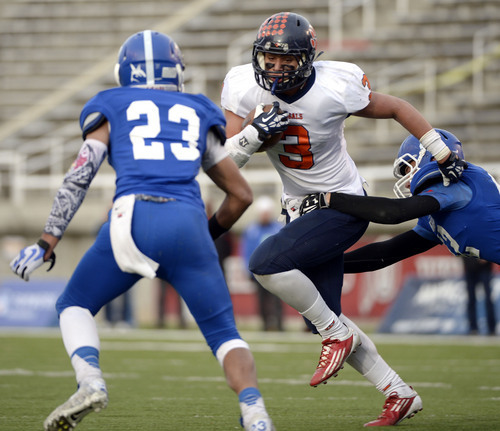 Steve Griffin | The Salt Lake Tribune Brighton running back Osa Masina tries to sweep around the end during first half action in the 5A championship football game against Bingham at Rice Eccles Stadium in Salt Lake City, Utah Friday, November 22, 2013. 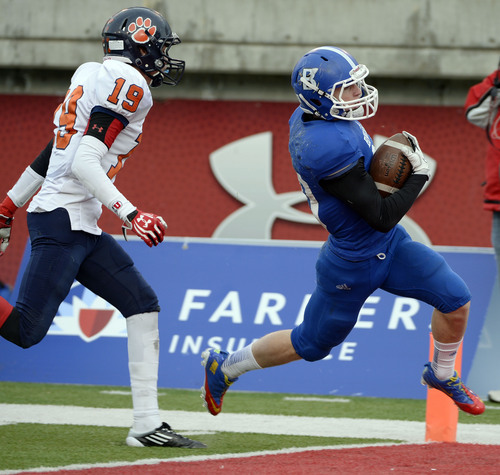 Steve Griffin | The Salt Lake Tribune Bingham running back Scott Nichols hauls in a pass and runs for a long touchdown during first half action in the 5A championship football game against Brighton at Rice Eccles Stadium in Salt Lake City, Utah Friday, November 22, 2013. 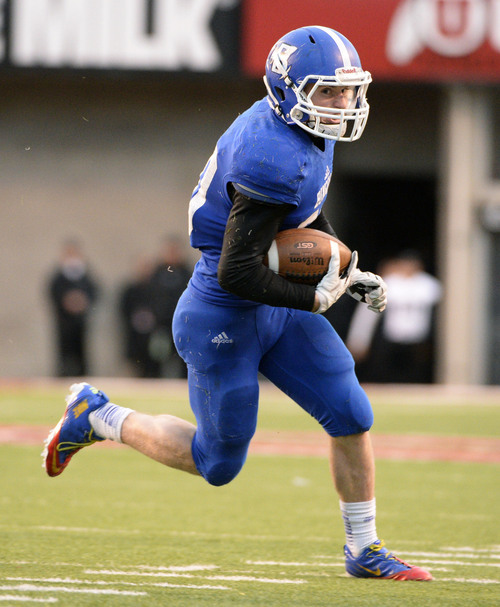 Steve Griffin | The Salt Lake Tribune Bingham running back Scott Nichols sweeps the ball around the end on his way to a touchdown during second half action in the 5A championship football game against Brighton at Rice Eccles Stadium in Salt Lake City, Utah Friday, November 22, 2013. 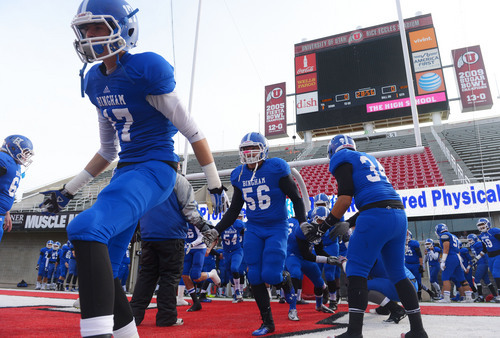 Steve Griffin | The Salt Lake Tribune Bingham players take the field prior to the start of the 5A championship football game between Bingham and Brighton at Rice Eccles Stadium in Salt Lake City, Utah Friday, November 22, 2013. Steve Griffin | The Salt Lake Tribune Bingham quarterback Kade Jensen runs the ball up the middle during second half action in the 5A championship football game against Brighton at Rice Eccles Stadium in Salt Lake City, Utah Friday, November 22, 2013. 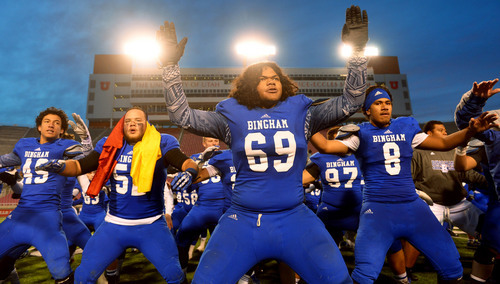 Steve Griffin | The Salt Lake Tribune Bingham players perform the Haka after they defeated Brighton for the 5A championship at Rice Eccles Stadium in Salt Lake City, Utah Friday, November 22, 2013. When some Bingham High football fans heard the Miners were facing a team ranked No. 1 in the country, their reaction was that Utah&apos;s defending 5A champion might not be up to the task. But veteran Miners coach Dave Peck said his team is looking forward to playing five-time defending Nevada state champion Bishop Gorman on Friday night in Las Vegas. "My response is, &apos;What a great opportunity for our program,&apos;" Peck said as he prepared his players for a 6 a.m. bus ride to Nevada on Thursday morning. "This is a great opportunity for our kids to showcase what Utah football is like. Our kids are well-coached and well-prepared. We expect to play a good game." That said, Peck is realistic enough to know that the Catholic school from southern Nevada will definitely challenge the Miners&apos; 16-game winning streak, currently the longest in Utah. USA Today ranks the Gaels as the top high school football team in the U.S. Bishop Gorman is ranked third by PrepNation and eighth in the MaxPreps Excellent 25. 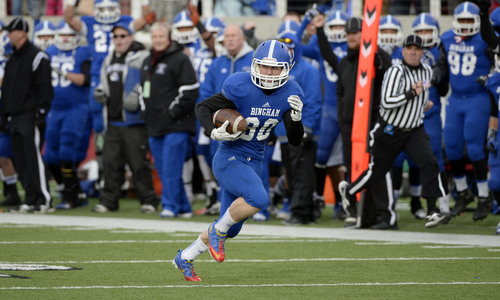 Bingham has been moving up in the national polls. The Miners are currently ranked 18th by USA Today, 23rd by PrepNation and 24th in the MaxPreps Excellent 25. "Bishop Gorman averages 290 [pounds] along its front line," said Peck. "They are big and physical. They have a great team. We expect our kids to compete." The Gaels switched quarterbacks last week in a 48-27 win over Servite, Calif. According to David Schoen of the Las Vegas Review-Journal, sophomore Tate Martell replaced senior Danny Hong to jumpstart the Bishop Gorman offense. 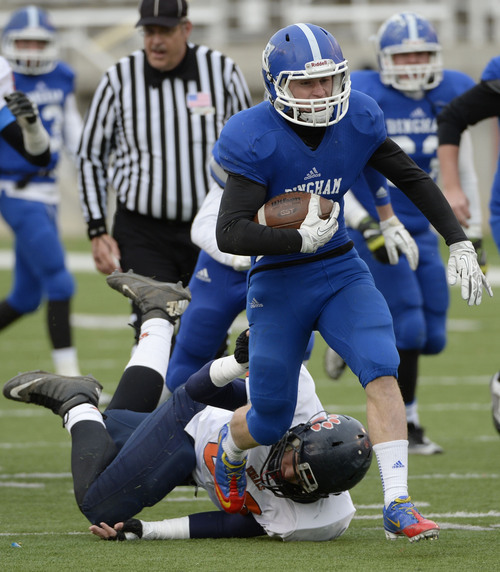 There is no quarterback controversy at Bingham, where senior Kyle Gearig continues to rank among Utah&apos;s elite signal-callers as he has led the Miners to relatively easy preseason victories over Davis and Herriman. Peck called the Gaels&apos; stadium the nicest prep facility in the nation. "It looks like a small college," he said. 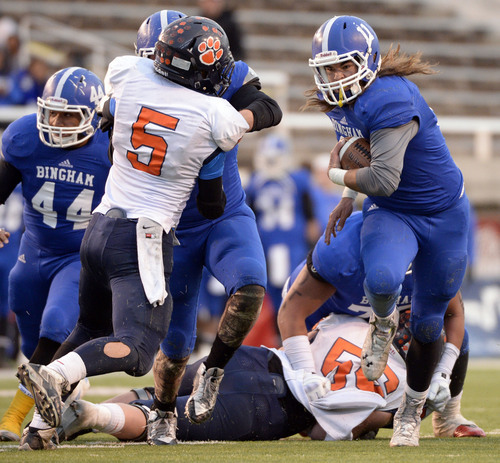 The veteran coach expects a number of Bingham supporters and Utah fans to be in the stands and said tickets were still on sale at Bingham High School. Peck feels as though the long ride and the chance to play against a nationally-ranked foe provides many benefits to his team. "We pride ourselves in running a class program, and this gives them a chance to showcase themselves," he said. "They are fine young men who represent Utah well. When the kids spend time together, they get closer and get to bond real quick. It&apos;s us against them. The kids have to be ready to play the best game they have ever played if we expect to be in this game." • Summit at Layton Christian, 4 p.m.
• Monticello at Richfield, 6 p.m.
• Bingham at Bishop Gorman (Nev.), 8 p.m.